In the darkness of a moonless night, a cat creeps throughout the house. He stealthily makes his way to the nearest corner and … lets loose with a stream of pee! It’s a crime! And it’s one of the most frustrating and infuriating aspects of cat guardianship. What do you do with a cat that won’t urinate where he’s supposed to? Well, fear not! Multi-award-winning cat behaviorist and author Dusty Rainbolt has written a guide to help you solve this crime against carpets (and walls, and furniture, and clothes). Cat Scene Investigator: Solve Your Cat’s Litter Box Mystery is 203 pages of solid information, tips, and solutions for inappropriate elimination problems. Just as with any crime scene investigation, the first step to solving house soiling problems is gathering evidence and looking for motive. Rainbolt expands on a lot of the things we’ve talked about here at Paws and Effect, and does so in an entertaining and helpful way. 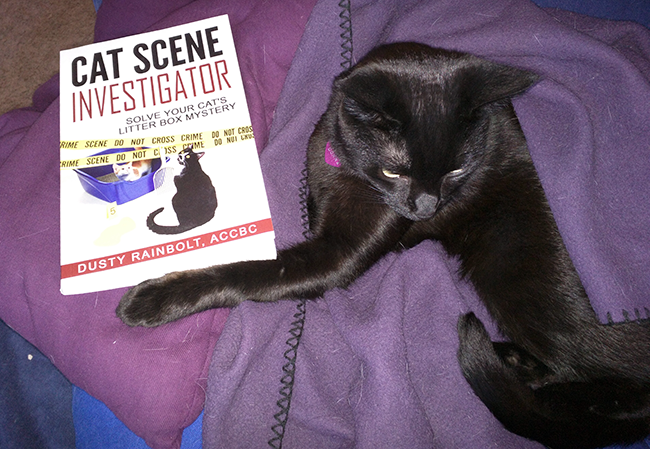 From there, Rainbolt goes on to explain how to do the rest of the detective work involved in dealing with your cat’s inappropriate elimination problems. There are many potential health and behavioral causes for house soiling, and Rainbolt explains all of them. She also provides “Tails from the Trenches,” stories about people whose cats have had inappropriate elimination problems and successfully resolved them with the tips outlined in Cat Scene Investigator. As you probably know if you’ve been reading Paws and Effect or following our Facebook page, I too have faced the problem of inappropriate elimination. Thanks to using the techniques found in this book, I’ve been able to eliminate (ahem) that problem, and Paws and Effect HQ is now a stink-free zone. I can’t recommend this book strongly enough for anyone who’s facing house soiling issues, or who wants to prevent them in the first place. You’ll get everything you need to know about how to resolve the health and behavior issues that cause inappropriate elimination. Even if you just want to know more about how cats relate to other cats–inside or outside the home–you’ll find Cat Scene Investigator to be a great, fun read packed with great information, not to mention awesome cartoons by Stephanie Piro. Get this book today–it’ll make a great holiday gift for the cat lover in your life! Disclosure: I received a free copy of Cat Scene Investigator in exchange for this review. However, Paws and Effect never endorses any product or book we don’t think would be of value or interest to our readers.